THE PLAN EVOLVES . . .
unlikely to work in an emergency. 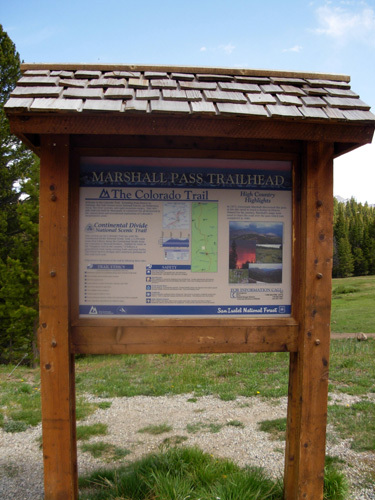 The next 100 miles is the least traveled portion of the CT."
This is about Plan #6 of "How Shall I Finish My Last Five-Plus Segments of the Colorado Trail?" and it hatched during our short stay in Leadville. Last year I had no problems with snow because it was a low-snow year in the Colorado Rockies. This year is a different story, with more normal levels of snow during the winter and more late-season snowfalls. Snow still lingers in shady and deep spots at around 10,500 feet and above. I've already encountered significant problems with snowdrifts in Segment 4. Is it any better farther south near Marshall Pass? Has an appreciable amount of snow melted since June 4, when I post-holed through Segment 4 west of Denver? 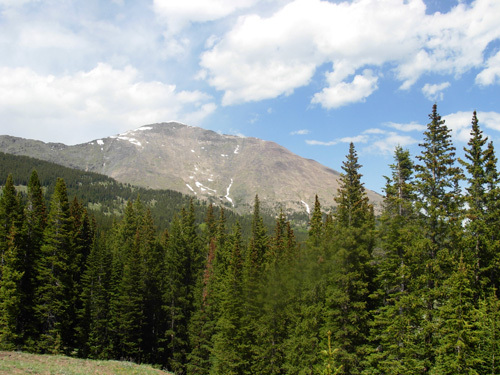 The weather has been unusually hot for the Front Range this week -- triple digits in Denver, for example -- so maybe more snow is gone in the mountains. And it didn't look that bad around Leadville, north of here . . . Thus my plans re: which segments to do when have been evolving on a day-by-day basis as I read the descriptions of each segment, listen to weather reports, and ponder the S-N-O-W situation. We've been pretty clueless about snow levels on this approximately 80-mile section between Marshall Pass and Eddiesville. Since it is so remote, it's next to impossible to find someone who's actually been up there on foot, bike, or horse. The best I can do is run the lower-elevation segments first and decide from those whether the higher ones can be done now or if I'll have to wait a few more weeks. If I was back-packing and could stay on the trail overnight, the snow wouldn't be as much of a problem. With Jim crewing for me and not knowing whether I'm able to go from Point A to Point B, it IS a problem. Because it's wilderness, there is no cell service. I can't just call him if I reach an impassable area and have to turn around and go back too Point A. Meanwhile, he's expecting me at Point B. How long should he wait for me before he goes back to Point A? Could be a real nightmare, you know? My last plan was to do the two lowest of the five sections first. That would be Segments 18 and 19 from CO 114 to Eddiesville. Although the trail follows the Continental Divide there, elevations range from only 9,500-10,400 feet -- the chance of snow problems would be about nil. I could knock out those two segments, go on to Silverton for three weeks, and catch Segments 15-17 (plus six pesky miles left to do in Segment 14) on our way back to Leadville. But I really, really wanted to do more of the Colorado Trail NOW. Those un-done sections have been bugging me for a year! Yesterday in Leadville I got another bright idea:. perhaps I could do Segments 14-15 first -- since we'd come to them first -- with a little bit of ingenuity. If snow wasn't a problem there, maybe I could do Segments 16-17 next, then 18-19, and I'd be done! But how do I deal with the inevitable snow in a section that reaches almost 12,000 feet for a little while?? One way to help determine the snow situation for Segment 15 was to drive as high on the course as possible. That would be Marshall Pass (elev. 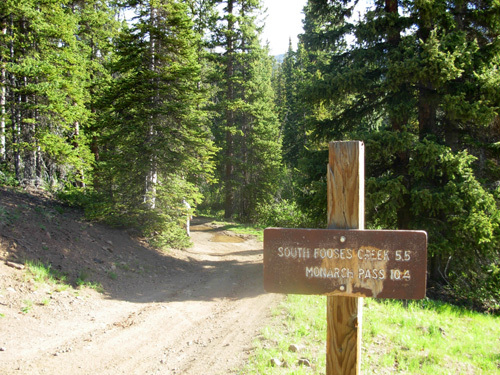 10,842 feet), the trail head between Segs 15 and 16. I hoped we could assess the snow situation better at the pass than we could down in the valley. 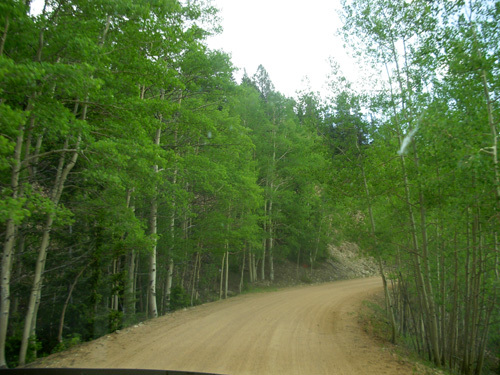 Our plan was to park the camper somewhere in Poncha Springs and take the truck up to the pass, a drive of about eighteen miles. That couldn't take very long, could it? And if the snow looked too high there, we'd hitch the camper back up and move on to Gunnison today and I'd do Segments 18-19 tomorrow. They have to relocate several miles of the CT and build a major bridge over Clear Creek to take the trail off private property that changed hands last year. 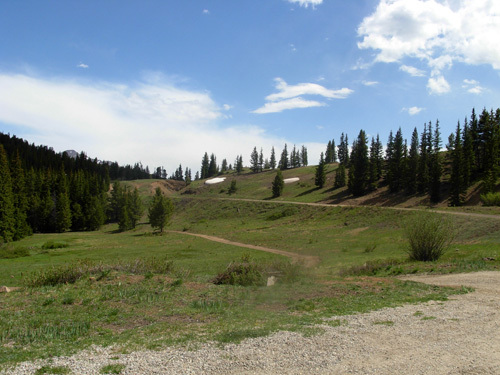 The new owners don't want the legal liability of having trail users on their land. I want to re-run the new parts of those two CT sections in August if the work has been done, and offer my help if they still need it then. 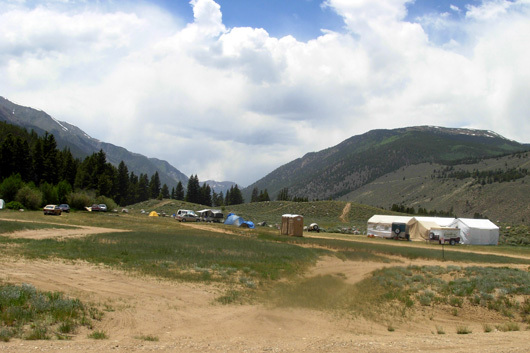 The camping area is so large that it shouldn't affect our plans to stay there for several days. As soon as we got to Poncha Springs, Jim spotted the visitors center and its large, unoccupied parking lot. The center was closed. You know the saying: It's easier to ask for forgiveness than permission. We un-hitched the camper and took off for Marshall Pass with the dogs. It shouldn't be a problem to park there for just a couple hours, should it? It was a beautiful drive to Marshall Pass, but those eighteen miles took at least 45 minutes. That's a big problem for crewed runners, hikers, cyclists, or equestrians in this remote area -- long drives to trail heads. And this is nothing compared to the Eddiesville trail head! 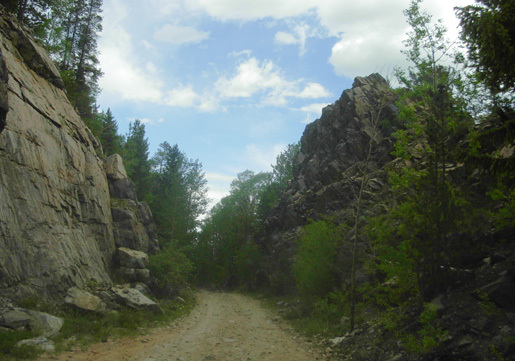 The road is pretty smooth and passable in a 2WD vehicle, although it gets narrow in some places. Of course, you can't see if any snow remains in the dense forest until you enter it! I'd re-discover that in the morning. This was looking good for my new plan! Segment 15 flanks the west side of Mt. Ouray for several miles, topping out at just below 12,000 feet on a ridge 6.4 miles into the segment. 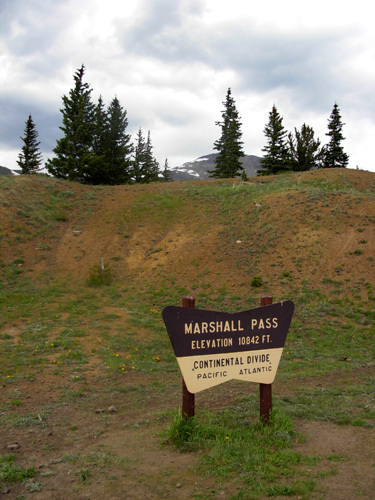 My brilliant idea was to go northbound from Marshall Pass and tackle the highest part of the course first. Jim would hike in with me to the high point and we'd know by then if I could do the entire segment or have to turn around. If it looked OK, I'd continue on with Cody another fourteen miles to the Angel of Shivano campground trail head in Segment 14, where I ended last year. It sounded like a fast, scenic eight-mile 3,200-foot drop down to US 50 in the Fooses Creek drainage area, then just six miles up to the rendezvous point. Jim would return to the truck for a nice 13-mile training run at altitude, clean up at the camper, get Tater, and drive about nine miles to pick me up at Point B. Sounds reasonable, eh? Jim agreed. We drove back down to Poncha Springs, pondering which of two private campgrounds we'd use that night. 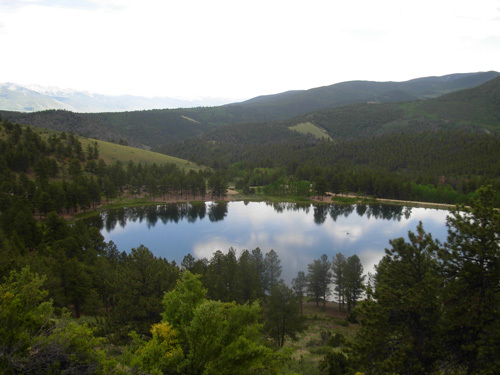 Three public national forest campgrounds in the area, including O'Haver Lake, could accommodate rigs up to only 22 feet long, so our options were limited. When we got back to the visitors' center, a man named Ray pulled in and unlocked the door to the building. Hmmm. Jim had already mentioned how nice it would be to just boon-dock in the parking lot, but we'd already seen a sign that said no overnight parking. It was the most convenient place to park for both trail heads of this segment. Better yet, it'd be free. Did we dare ask? Jim went in to talk with Ray. When he asked him if he worked there, Ray joked that he "owned the place," and yes, it'd be fine (despite the sign) for us to stay overnight -- or longer, if needed. Yes!! I'd call him a Trail Angel. Other than some road noise, we had a pleasant night. We were both looking forward to new adventures on the Colorado Trail in the morning.